The greatest mass extinction of all time took place at the end of the Permian (Benton, 2003), and the tetrapods were involved. Of the 48 families that were present in the last 5 Myr of the Permian, the Tatarian Stage, 36 died out (a loss of 75%). These include ten families of basal tetrapods (mainly anthracosaurs), captorhinids, millerettids and pareiasaurs, as well as the younginids, and 17 families of therapsids, including the gorgonop-sians, the last dinocephalians, most of the dicynodonts, and many families of small insect-eaters (Figure 5.21). Only 12 families of tetrapods survived (Benton, 1993a). It is hard to estimate the levels of loss at generic or specific level, because of patchiness of the fossil record. Modesto et al. (2003) have shown, for example, that when a cladogram is drawn, several lineages can be shown to have survived the extinction horizon, even though fossils are yet to be found. This dramatic loss of tetrapod families represents the largest mass extinction in their history. The families that died out include a broad range of ecological types, from small to large, from carnivores to herbivores, and the event affected tetrapods worldwide. At the same time, more than 50% of marine invertebrate families died out, the highest rate of extinction in the history of the seas. Losses of50-75% offamilies on land and in the sea equate to losses of 80-96% of species, according to different calculations. Estimates for the timing of the end-Permian event have tightened up considerably. Whereas in 1990 many geologists estimated a duration of 5-10Myr, more precise radiometric dating (Bowring et al., 1998) shows that the Permo-Triassic boundary is dated at 251Myr ago, and the mass extinction was rapid, taking less than 500,000 years. Studies of continental sequences in the Karoo (see Box 5.5) show a stepwise loss of tetrapod genera through a short span of the sedimentary sections (Smith and Ward,2001). Catastrophists have attempted to explain the end-Permian mass extinction by the impact of an asteroid, the favoured explanation for the KT event (see pp. 248-55), but there is limited evidence for this at the end of the Permian. There were, however, massive eruptions of basalt lava in Siberia. Over the course of perhaps 500,000 years, some 3 million km3 of lava were erupted over a vast area. The eruption released huge volumes of gases such as CO2 and SO2 into the atmosphere, and this probably caused catastrophic temperature changes and oxygen depletion (Wignall, 2001). The oxygen depletion, associated with greenhouse heating of the atmosphere and oceans, combined to kill off most plants on land and much of the plankton. With the plants gone, soils and organic matter were washed into the sea. Heating may have reached such a level that gas hydrates, huge volumes of methane frozen in ice deep around the continental margins, were unfrozen and released. These would have burst to the surface of the oceans, expanding massively in volume and further driving the greenhouse heating effect. Fig. 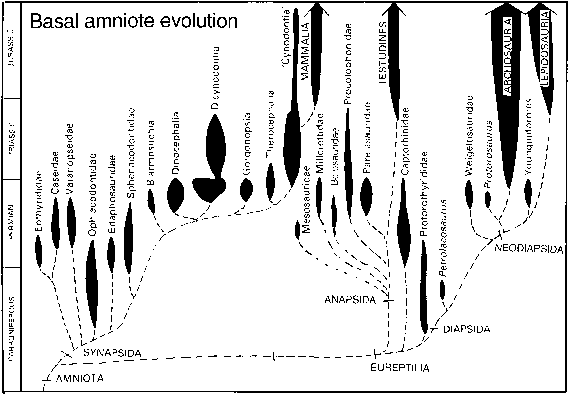 5.21 Phylogeny of the early amniotes, showing the known fossil record (vertical scale), relative abundance (horizontal dimension of 'balloons'), and postulated relationships (dashed lines). some 40-50 tetrapods in a fauna, ranging from tiny insect-eaters to giant sabre-toothed gorgonopsians that preyed on the thick-skinned pareiasaurs and dinocephalians, only two or three tetrapod taxa survived. Most famous of the survivors was the dicynodont Lystrosaurus, which spread worldwide in the earliest Triassic. Such dominance by a single taxon, making up perhaps 95% of the post-extinction faunas, is a sure indication that a major crisis has happened. 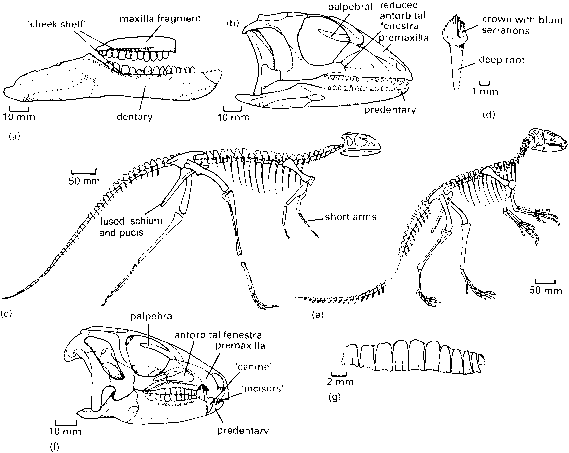 Other survivors included two or three 'temnospondyl' lines (see p. 97), some procolophonids, some basal archosaurs and lepidosauromorphs (see Chapter 6), and some the-rocephalians and cynodonts.